The following resources provide background information for the Sacred Places/Civic Spaces initiative and Design Challenge. This research, led by PennPraxis at the University of Pennsylvania with assistance from Partners for Sacred Places, seeks to document Philadelphia’s historic sacred places, to examine the role these buildings play in the city’s public life, and to analyze what factors are likely to determine whether those currently functioning as religious facilities will continue to do so—or face different futures in the years ahead. A study conducted by Partners for Sacred Places calculates the "economic halo effect" of 90 randomly-selected congregations with older and historic buildings in Chicago, Fort Worth, and Philadelphia. The average congregation made a contribution to the local economy valued at $1,707,249. For years, Partners for Sacred Places has had to depend upon anecdo- tal information to make its case for the importance of sustaining and preserving America’s older and historic religious properties.Thanks to the national study of over 100 congregations with pre-1940 properties in six cities commissioned by Partners and profiled in this book, we are now equipped with dramatic findings that will help us make this case much more powerfully. Partners for Sacred Places’ data validates the commonly held assumption that development pressure directly affects the fate of a closed church or synagogue. In fact, the vast majority (79 percent) of recent demolitions in the city are associated with development pressure, which is occurring at an unprecedented rate in neighborhoods—traditionally working class and immigrant neighborhoods—throughout Philadelphia. While many neighborhoods don't have a library, museum, arts organization, or even a school that can become the fulcrum of community activism and growth, nearly all have a church, synagogue, mosque or temple. Religious institutions have a powerful role to play in their communities, addressing pressing issues from poverty and injustice to planning and traffic. Philadelphia’s neighborhoods are studded with hundreds of historic churches. But as attendance steadily declines, many of these religious buildings have fallen into disrepair. Some have been forced to become something else entirely, like loft-style apartments. In West Philadelphia, the Calvary Methodist Episcopal Church at 48th Street and Baltimore Avenue, faced a similar fate. The building had fallen into disrepair, but instead of allowing the demolition of the church, the neighborhood saved the space by embracing the diversity of the surrounding community. Churches are centers for community gatherings, but as less people remain affiliated to specific religions they need to adapt to continue connecting people. 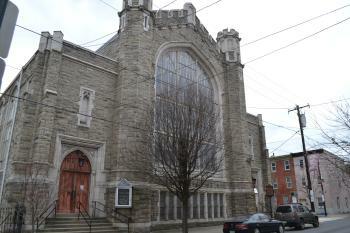 This guide has been developed by the Preservation Alliance of Greater Philadelphia to assist congregations that wish to explore shared uses or leasing portions of their properties. It contains a step-by-step process for assessing building conditions, exploring potential tenants, and estimating the market value of surplus real estate – illustrated by three case studies of specific churches in Philadelphia whose congregations wanted to explore the possibility of leasing space to other organizations as a means of generating income. The guide and case studies were developed for the Preservation Alliance by Urban Partners and Kelly/Maiello Architects.